When one thinks about project development methodologies, the first thing that comes to our mind are the methodologies described in PMBOK guide or PRINCE2 Manual. Therefore a question always arises in our minds, is another methodology really required? The answer to this question lies in the fact that over the last 10-15 years the world of people working in the Knowledge Environment has changed drastically. People working in the Knowledge environments such as Information Technology (IT), Engineering, Teaching, Scientists, Lawyers, Doctors often need to work differently than the conventional Manufacturing environments. The key in the Knowledge environment lies in Communicating, Collaborating, Adapting to provide maximum value, since everyone in the Knowledge world is special – they have something unique and they have something more to contribute than following orders routinely. This is the thought process which has evolved the development methodologies in the recent past in the Knowledge based environments. Development methods exist on a continuum from adaptive to predictive. Agile methods lie on the adaptive side of this continuum. One key of adaptive development methods is a “Rolling Wave” approach to schedule planning, which identifies milestones but leaves flexibility in the path to reach them, and also allows for the milestones themselves to change. Adaptive methods focus on adapting quickly to changing realities. An adaptive team changes as per needs of the project. An adaptive team will have difficulty describing exactly what will happen in the future. The further away a date is, the more vague an adaptive method will be about what will happen on that date. When asked about a release six months from now, an adaptive team might be able to report only the mission statement for the release, or a statement of expected value vs. cost. Predictive methods, in contrast, focus on analyzing and planning the future in detail and cater for known risks. In the extremes, a predictive team can report exactly what features and tasks are planned for the entire length of the development process. Predictive methods rely on effective early phase analysis and if this goes very wrong, the project may have difficulty changing direction. Predictive teams will often institute a Change Control Board to ensure that only the most valuable changes are considered. There are many specific agile development methods and frameworks. Most promote development, teamwork, collaboration, and process adaptability throughout the life-cycle of the project. Agile Methodology fixes cost, quality and time at the outset and uses the MOSCOW prioritization of scope into musts, shoulds, coulds and won’t haves to adjust the project deliverable to meet the stated time constraint. The non-negotiable part is the Time and Cost. That is, you need to deliver features in a fixed time and at a fixed cost. What to deliver can be adjusted as per prioritization and as per the estimates in a given time and given cost. The most appropriate projects for agile are ones with aggressive deadlines, a high degree of complexity, and a high degree of novelty (uniqueness) to them. We want to use agile when we are doing something that is new, or at least new to the team building it. If it’s something the team has done before over and over then the team probably doesn’t need an agile approach. To my mind, this is where some of the manufacturing analogies come in. If we are building the same car day after day, we learn pretty quickly all the nuances of building that car. We don’t need an agile approach because the novelty of the situation is low. Novelty alone does not mean we should use an agile process. The project needs a certain amount of complexity. One final element I believe is required in making a project appropriate for agile is urgency. 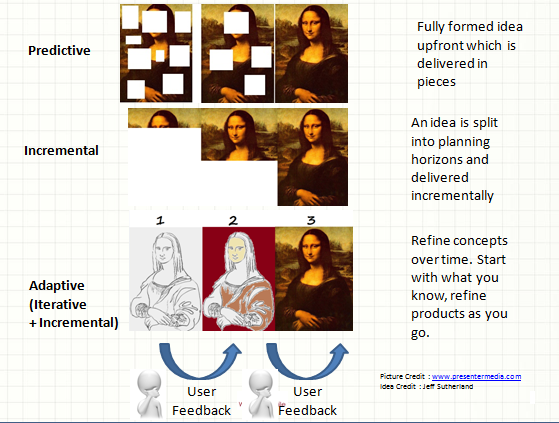 The timeboxes and iterations of an agile approach are devised to keep the intensity and focus going on a project. If there’s no urgency to the project, those are unneeded. So let’s see how these three factors–urgency, complexity, and novelty–mix on various projects, starting of course with software projects. There couldn’t be a better fit. Software projects are notoriously complex. Each software project is largely a new endeavor. And in today’s world, there is almost always a sense of urgency.